The Elephant Roundup is one of the most significant cultural commemorations that take place in Thailand. This event takes place in Surin – Northeastern Thailand – every year. The festival is a joy to behold and you will get to appreciate how these majestic animals make up such an elaborate part of the nation's turbulent and colorful past as you get close to them. The people of Thailand really love elephants. There is also a trending believe that states that the shape of the country is like the head of an elephant. Thais easily domesticates Local Asian elephants. They use it as a means of transportation or carrying logs. Since ancient times, wild elephants wandered without restrictions in the forests around the country. These wild elephants were rounded up in Surin, they were captured and caged in hunts that were extremely ritualistic and involved a lot of mythological aspects. The captured elephants also became beneficial to the economy, as there were controlled and used as pack animals or as war animals sometimes. Historians noted these ritual hunts as ancient as Arrian, Strabo, and Megasthenes. Most of the hunters were from the Kuy tribe, and they perform a lot of rituals prior, during, and after the main hunt. Some of the rituals they perform included divination from bones, praying to the ancestors, praying to the lassos for the power to corral the elephants, and putting on special attires believed to have protective powers. They also offer prayers to woodland and terrestrial spirits to grant them success in the hunt. When Does the Surin Elephant Roundup Event Hold? The Surin Elephant Roundup festival holds every year on the 3rd Saturday in November. The first time the festival held was in 1960, and it lasted for two days. The time of the year the event holds is the cool season and the temperature at this period ranges from sixteen to thirty degrees Celsius. The Surin Elephant Roundup festival takes place Surin – a small province that is situated in the Northeastern province of I-San in Thailand. The town is 480 KM northeast of Bangkok. Specifically, the festival holds at Is Narong Stadium - which is the largest domestic elephant village in the world. The Thailand elephant festival includes a lot of activities, such as elephant racing, elephant shows to showcase the strength of Thai elephants, historical exhibition of battles involving elephants at the stadium, etc. There is a massive procession of three hundred elephants. The villagers prepare food in large quantity for all the elephants – this is referred to as “Elephant Breakfast.” The locals usually take the leftovers after the elephants are fed. One of the most significant and strange events in the festival is the tug-of-war rivalry between the members of the Thai army and the elephant. The festival is spread across three days, and here's the breakdown of the event. The first day of the elephant festival begins with a marching procession that features a mass of elephants moving through the city of Surin from the railway station towards the elephant roundabout at Prasat Road. Some of the elephants usually carry mahouts in replicas of battle attires from the battles of Thai-Khmer-Burma-Laos. After the elephant procession comes the natives of Thai in their traditional clothes, playing music and dancing. After this comes the elephant banquet and the elephant banquet can only begin when all the elephants have arrived. 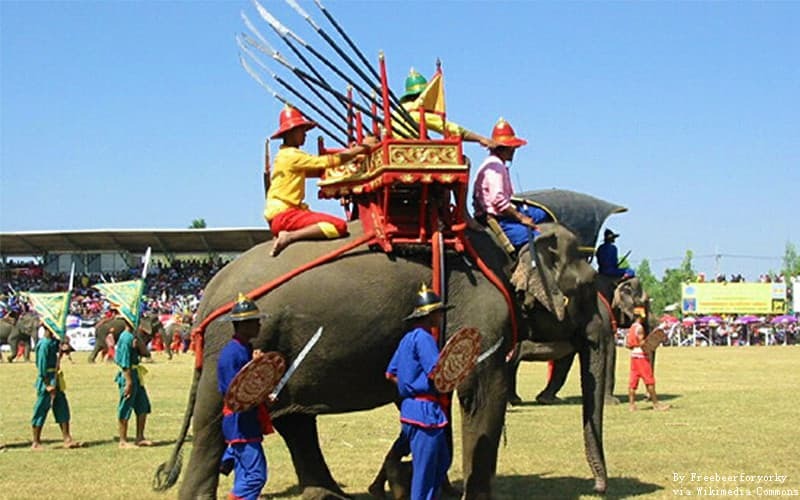 The second day of the elephant festival takes place at the Sikhoraphum Castle Amphore. The ancient facility is located at Khmer temple – which is between the cities of Sisaket and Surin. The structure was built for Hindu worship by King Suryavarman II in the 12th-century. The cultural show portrays in dance and song how the early people of Surin came to the town with their elephants and talks about the number of battles they fought with invaders from Cambodia, Lao, and Burma. The mahouts amass their elephants at the Elephant Stadium, and the chairperson of the occasion starts the day with a speech. After the speech from the chairperson, baby elephants are paraded in the stadium, after which the processional march of bull elephant follows. After the march of bull elephants come the hunters of Kuy – the native inhabitants of Surin – who have been corralling and training elephants for hundreds of years. They display how their ancestors capture elephants both by working alone and using elephants that are trained. Domestic elephants that were trained to corral their wild kin, have been raised by the people of Kuy for centuries and they are known as Koomkies or Khonkies. After the displays of how elephants are captured, there comes the display of various acrobatics, polo and football matches, together with the showcasing of tasks carried out by tamed elephants, such as hauling logs and elephant racing. Another event that showcases the raw strength of the Thailand elephant in Surin is the elephant tug-of-war competition. The competition begins with fifty personnel against the strongest bull elephant. As the bull proves stronger, fifteen more people will be added to the group until they are one hundred personnel matched against one bull elephant, even at that, the bull always wins. The show usually ends with the re-enactment of the historical battle between Burmese and Siamese forces. Both forces are dressed in local customs and colors with blue for Burma and red for Siam. They assume a traditional battle tactics position, with foot soldiers in front, elephants shielding the King Elephant in the central ground, flanks containing cannon, and finally more foot soldiers. Alongside the elephant show, the stadium also hosts a mini-half marathon tagged “Mueang Chang.” The Red Cross Society also displays some cultural performance, showcasing the ethnicity of the town. This has made an elephant tour in Thailand very popular, and riding elephants in Thailand is one of the major goals of most tourists. Volunteer at Real Elephant Sanctuary with UME Travel!